Should You Ban Girl Scout Cookies? In case you haven’t checked the ingredients lately, Girl Scout cookies contain palm oil. That’s not great for several reasons. Palm oil has more saturated fat than alternatives like canola and olive oil, both of which are more earth-friendly oils. And palm oil plantations are taking away crucial habitat for endangered animals like orangutans, pygmy elephants and Sumatran tigers. Also, the palm oil industry has been associated with gross human rights and labor violations. If there’s an alternative that’s better for you and better for the environment, why continue to use palm oil? Grist reports that Rhiannon Tomtishen and Madison Vorva, two Michigan Girl Scout members, are protesting the use of palm oil in cookies by refusing to sell them. Word is that Girl Scout USA CEO Kathy Clonginer isn’t very receptive to the idea of abandoning the use of palm oil. Meanwhile, Britain’s sister organization to the Girl Scouts (the Girl Guides) have done away with palm oil in their cookies. The result? A 60 to 70 percent reduction in saturated fat! Please email the Girl Scouts USA to let their leaders know that you’re interested in switching to a more healthy oil. 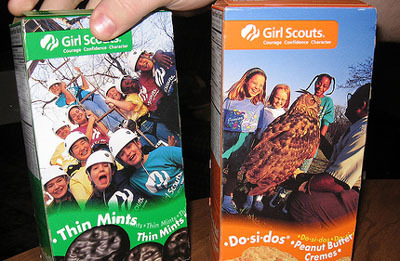 UPDATE 3/17/11: Find out more about Kellogg’s response to these Girl Scouts at Grist. I want to commend these girls for standing up for what is right. We all need to vote with our forks and not buy any fake food that is so unhealthy for us. It is no wonder more people are getting sick form eating GMO foods and foods with harmful chemicals and fat. What has the world come to?